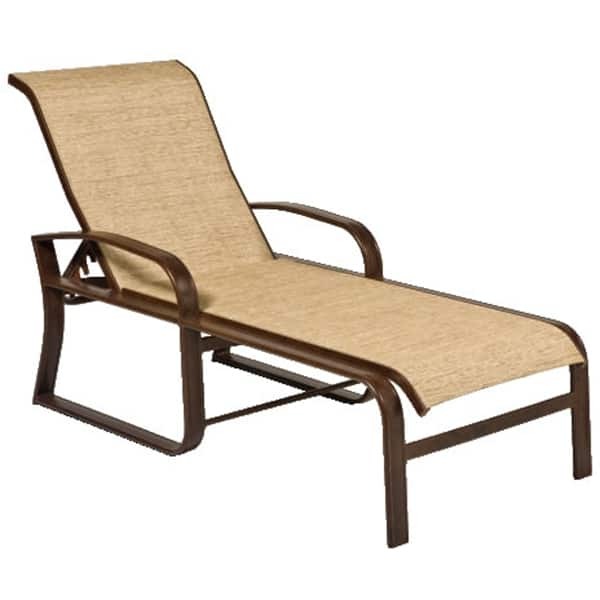 With a modern, attractive design combined with all of the benefits of durable and easy-to-clean sling fabric, it's hard to ignore the Cayman Isle Sling Chaise Lounge from Woodard. Featuring the latest materials in the patio furniture industry, from the vinyl-coated polyester slings to the powder-coated aluminum frames, this chaise lounge requires little care and is virtually maintenance free. And the comfortable sling is encased in a contemporary design that showcases pleasant curves that are sleek, granting a refined and clean look around your swimming pool. Imagine the weekends with a few chaise lounge placed next to your backyard water hole; guests will love the multiple sitting positions available with chaise lounge seating! W 26.8" x D 75" x H 21" LBS 38 SEAT HEIGHT 15"